There are many places in and around Astoria where time and space fold in upon each other and you find yourself at the corner of an avenue and street which bear the same number. 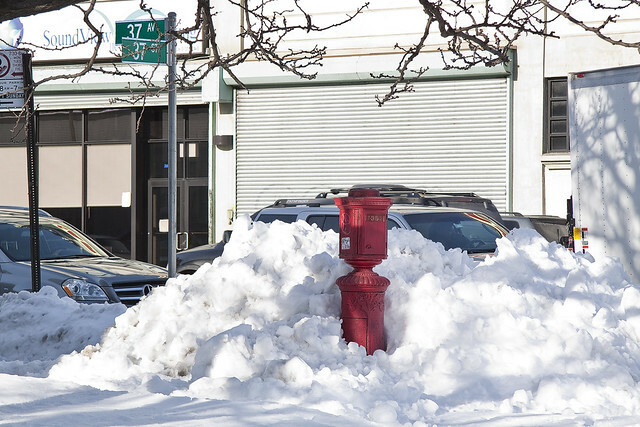 This scarlet paladin withstands and discharges its duty despite the frozen indignity heaped on and around it at the junction of 37th avenue and 37th street- just off Northern Blvd. Who can guess what odd sights it has witnessed at this tripartite angle between Dutch Kills and Astoria and Queens Plaza, and what strange attractors frequent such concurrent corners?